The amounts stated below are examples of compensation for asbestos diseases and are commonly awarded for the areas described. A claim can provide a sufferer and their family with financial security for the future. Mesothelioma, Asbestos Lung Cancer or Severe Asbestosis causing serious disability where progression leads to premature death. Level of damages will be affected by age, ability to work and effect on life expectancy. Chest problems including breathlessness and cause aggravation to an existing condition such as Bronchitis, Emphysema, Pleural Thickening and Plaques. The amount of compensation you may receive is intended to reflect the financial position you would have been in had you not been diagnosed with mesothelioma or another asbestos related disease. 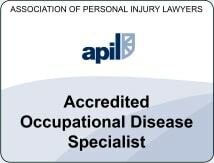 Our specialist asbestos solicitors will be able to provide more details following an initial consultation. Please bear in mind that every case is unique and the figures quoted here should serve as a guide only. If an insurer cannot be found, then the Goverment may award some compensation, depending on what you have been diagnosed with and when. This is especially the case for Mesothelioma claim. Scroll down to view the latest government award tables. If you cannot claim compensation from insurance companies, then the government will provide compensation for mesothelioma under the Mesothelioma Act of 2014. The first table below is a guide to the amount of compensation the government will provide for people with mesothelioma. The amounts listed are sourced from the Diffuse Mesothelioma Scheme from The Department of Work and Pensions and came in to force from the first of July 2014. These figures represent around 80% of the average valuation of a normal civil claim for someone of that age. So it is always worth looking into claiming against the companies where asbestos exposure may have occurred. Even if you cannot remember where you or a family member may have been in contact with asbestos, it would be worth a quick chat with us to see if we can help. It may be that you breathed in asbestos at home, school or hospital or were in the vicinity where asbestos was manufactured. You can call us on 0800 923 0046 for more details. Please be aware that these figures are from the date of diagnosis. If intend to pursue a claim for someone who has recently died from Mesothelioma against the insurers of the companies where asbestos exposure took place, then you have 3 years from the date of death. Though there is some flexibility in this, in fact our solicitors have won cases when the mesothelioma victim had died more than 10 years ago. The second column applies to people who were diagnosed from 25th July 2012 to 9th February 2015. The third column for people diagnosed with Mesothlioma from10th February 2015 onwards. The Pneumoconiosis Workers Compensation Act of 1979 makes provision for an interim payment to Mesothelioma sufferers. This typically arrives 4-6 weeks from claiming and will be part of the overall compensation payment. For example if you are 70 years old, you would receive £17,029 as an interim payment in around 6 weeks. If the claim settles for £100,000 in 6 months time, you would then receive the balance of £82,971. The table below is a guide to the interim payments. Please note that the amounts for spouses and dependants will be less than those listed if the mesothelioma victim has passed away. If you have any questions, please contact us by calling Freephone 0800 923 0046 and ask for Kathy or Warren. You can also request a call-back, fill out the claim form or use our online chat facility. If we can help, we will.